A side hustle is the best way to earn extra money, help you reach financial goals and build your resume or portfolio. While there are some side gigs that require college degrees, the side gigs below don’t require an advanced education at all. Bonus: they can make you pretty decent money too! Obviously I have to start out with blogging, because this is the side gig that helped me create extra income streams. Blogging is a great side gig and always will be because it doesn’t require much to start, and you can do it in your free time. In fact, I started my blog with only $10 and seven years later, I’m still at it. You can start your blog and get help getting up and running for only $2.95 per month through Bluehost, when you sign up through our link. You only have to make a few clicks, and Bluehost will get you up and running with a blog. While this side hustle won’t start making you money right away, there are plenty of ways to monetize your blog for some extra money even as a new blogger. The best news is that you definitely don’t need a college degree to make it happen. You just need a lot of grit and hustle. That being said, one of the best ways to make money blogging is through affiliate marketing. Affiliate marketing allows you to earn money when someone buys a product or service through your site. If you’re new to blogging, or new to affiliate marketing check out my friend Michelle’s course – Making Sense of Affiliate Marketing. She earns over $50,000 per month from affiliate marketing so she obviously has some good tips if you’re new to affiliate marketing. Think of proofreading as the other side of writing. You read content to correct writing mistakes made by others. Proofread Anywhere provides free courses to help you learn how to land general proofreading and transcript proofreading jobs you can do from the comfort of your home, or anywhere else you choose. 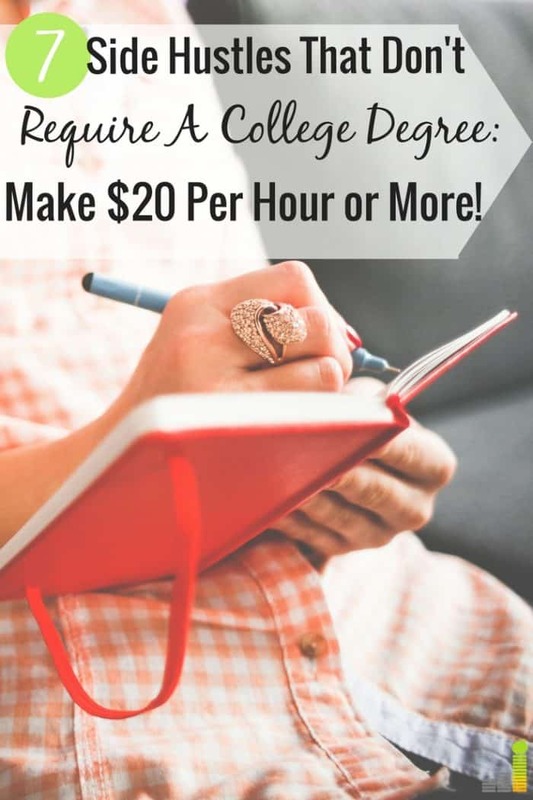 All you need is access to a computer and you can make $20+ per hour proofreading content. If you have great organizational skills, can juggle multiple tasks at once, and don’t mind building your online skill set, you could be the perfect virtual assistant. A virtual assistant is just as the name suggests. You’ll be part of a team that assists a solopreneur, blogger or small business owner. I’ve hired two virtual assistants in the past, and they’ve done amazing work. Many great virtual assistants charge $15-$30 per hour, which is a way better income than waking up at 5:00 a.m. and working at Starbucks for minimum wage. In fact, my friend Kayla is a full-time virtual assistant who earns over $10,000 per month. When she started out part time, she made less, but she was able to grow her business enough to take it full-time. If you’re interested in being a freelance virtual assistant, sign up for her course to learn everything you need to know. Do you have a spare bedroom in your home? Why not rent it out? I personally am not crazy about the idea of having strangers in my house, especially with my kids. However, my husband just went to San Diego and stayed with a young woman via Airbnb in a shared home. I thought she was crazy for letting a stranger stay there, but luckily for her, he’s a totally normal person and was the perfect guest. Depending on where you live, this could become a lucrative side gig. The greatest thing about this gig is you only need the space. No degree is required. Want to invest in real estate but don’t want to rent out your room? You can invest in commercial real estate with Fundrise, starting with as little as $500. You won’t get rich quick with surveys, but it’s a great way to make some extra money in your spare time. There are many survey sites out there, from those that pay in cash (which we like) to those that can also pay out in gift cards, but they are a great way to pad your wallet by monetizing your free time. Not all survey sites are legit, but there are many good ones to use. Do you enjoy sewing or doing crafts? If you answered yes to one or both of those questions, you could be an Etsy seller in your spare time! Selling your homemade products on Etsy is easy and can become a great way to engage your creativity while earning some cash. My sister started her own Etsy store a few months ago and is already making over $1,000 of extra money every month. I’m so incredibly proud of her, and she’s been working very hard at it while being in school full-time and raising a family. You can also sell items on Amazon to make extra money. If you have an eye for deals, you can flip them on Amazon to bring in extra money. Check out The Selling Family as they provide countless resources to help you start your own business selling products on Amazon. You can also sell items you create on CafePress. If you’re a designer you can sell many items, from T-shirts, to mugs, wall art and more. If you are tech savvy, being a website designer could be the perfect side gig for you. With so many people creating websites and blogs, everyone wants to make theirs look professional. While some people may be able to create their own website, there are quite a few who need help making everything work and look cohesive. I have always hired out this task and my most recent blog re-design cost over $2,000. So, it can be a great way for someone talented to make a living – no college degree required. This is a bonus way to make money that doesn’t require a college degree. To be a lifeguard, you need to know how to swim, perform CPR and be able to keep a watchful eye on a pool full of wiggly kids. While most pools or community centers require you to take a test and become CPR certified (or prove your certification). With that in hand, you could be earning up to $15, or more, per hour with no degree. Like babysitting, being a lifeguard is a great job for teenagers and college students. I personally think this also looks good on a college application because it shows you had the initiative to get certified to do it. 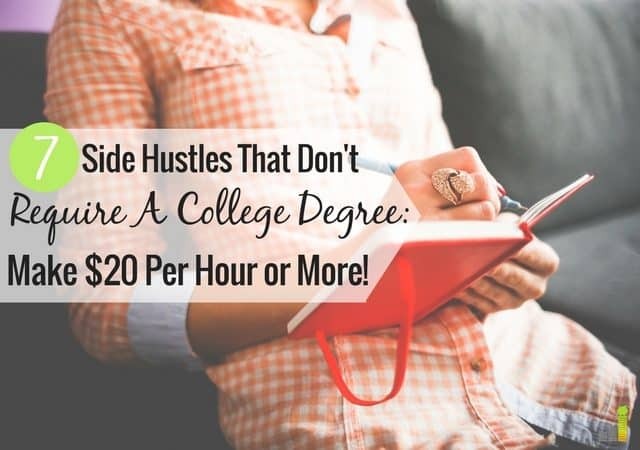 Ultimately, there are so many side gigs out there that don’t require any type of degree, and the ones I listed above are just a few. What other types of side gigs can people do to make extra cash? What are some that you’ve done yourself that have been successful? Have you ever sold things you’ve made on Etsy or another site to earn extra money? We’ve been renting out a spare room in our house on Airbnb now for a year and have been having a blast doing it! The great thing is that it forces us to keep our house clean. And it’s a pretty easy way to monetize your primary residence. I’ve made a nice side income for a while by babysitting and helping the elderly with small chores (like shopping or washing windows &such). I’ve actually had a good time with these ‘extra activities’, the kids were a delight and the seniors were all so nice and charming!